In June 2005 the firm Oculus introduced a commercial straylight meter, called C-Quant. It is based on a patent owned by the Netherlands Royal Academy (KNAW). It utilizes the Compensation Comparison method. 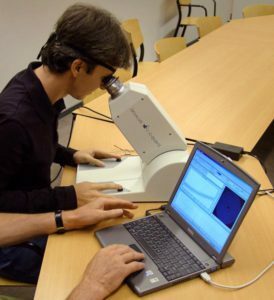 Straylight is assessed in a functional sense, as important for the visual handicap. It is determined by the psychophysical method of “Compensation Comparison”. We followed the definition for straylight of the international standards committee CIE. The CIE has defined disability glare as to be identical to (so defined) straylight.